Indonesia is the leading air conditioner market in Southeast Asian region. Led by rising investments, public & private infrastructure developments and government plans such as 20 Years Development Plan and Master Plan, which would drive government spending in various sectors such as housing, infrastructure, commercial, hospitality, manufacturing, education and healthcare. According to 6Wresearch, Indonesia's Air Conditioner market is projected to grow at a CAGR of 10.6% during 2016-22. In 2015, Indonesian air conditioner market declined due to weak economic conditions, lower investments and devaluation of country's currency. Further, the market demand was also affected due to elections held in the country. However, the economy is anticipated to recover in the years to come owing to rise in government spending on infrastructure development, FDI and DDI growth. Over the next six years, centralized air conditioner, particularly VRF market is exhibited to grow at a healthy growth rate due to increasing construction activities in commercial sector. Split air conditioner segment has dominated overall air conditioner market due to the high demand registered from residential sector. Java region is the key revenue contributing region in Indonesia's air conditioner market, which would continue to dominate through the forecast period. The report thoroughly covers the air conditioner market by types, applications, and regions. The report provides the unbiased and detailed analysis of the on-going trends, opportunities/high growth areas, market drivers, which would help the stakeholders to decide and align their market strategies according to the current and future market dynamics. • Historical & Forecast data of Global Air Conditioner Market for the Period 2010-2022F. •	Historical & Forecast data of Indonesia Air Conditioner Market Revenue for the Period 2010-2022F. •	Historical & Forecast data of Indonesia Room AC Market Revenue & Volume for the Period 2010-2022F. •	Historical & Forecast data of Indonesia Ducted AC Market Revenue & Volume for the Period 2010-2022F. •	Historical & Forecast data of Indonesia Ductless AC Market Revenue & Volume for the Period 2010-2022F. •	Historical & Forecast data of Indonesia Centralized AC Market Revenue & Volume for the Period 2010-2022F. •	Historical & Forecast data of Indonesia Centralized AC Market Revenue, By Components for the Period 2010-2022F. 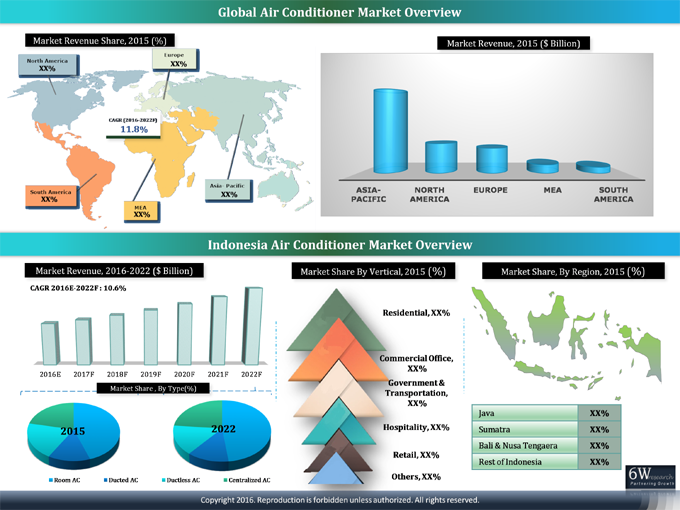 •	Historical & Forecast data of Indonesia Air Conditioner Application Market Revenue for the period 2010-2022F. •	Historical & Forecast data of Indonesia Air Conditioner Regional Market Revenue for the Period 2010-2015. •	Market Size & Forecast of Indonesia Air Conditioner Regional Market Revenue until 2022F. Indonesia Air Conditioner market is projected to grow at a CAGR of 10.6% during forecast period 2016-2022. Despite weak performance in 2015, air conditioner market is predicted to grow in the coming years owing to the growing government spending on infrastructure developments, expanding construction market, rising retail and hospitality industry and surging investing in residential & commercial sectors. Indonesia Air Conditioner Market report has been segmented into AC types, end user applications and regions. The major companies in Indonesia's air conditioner market include – Carrier, Panasonic, Daikin, Johnson Controls (York), LG, Hitachi, Samsung and Trane and Panasonic.